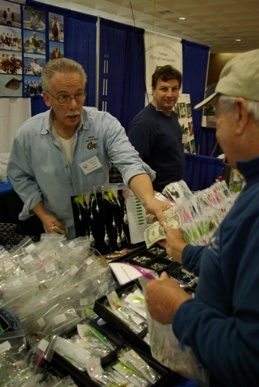 The 36th Annual New York Sportfishing Federation Forum & Auction will be held at the Freeport Recreation Center from February 16th, – 17th, 2019 with seminars by the region’s top fishermen. * New for this year’s show* We will be holding a door raffle at the Federation booth, located in the main forum area, for a fishing trip of a lifetime to the famed Tanaku Lodge in Alaska. 3 day, 3 night all inclusive trip. Tickets are only $10 a piece with a limited amount of 500 sold. Drawing will be held on Sunday the 17th prior to our auction. You do not have to be present to win. So be sure to stop by the NYSF booth to enter and speak to one of our directors for further details. Good luck!! Find great deals on tackle of all kinds at the Federation show. 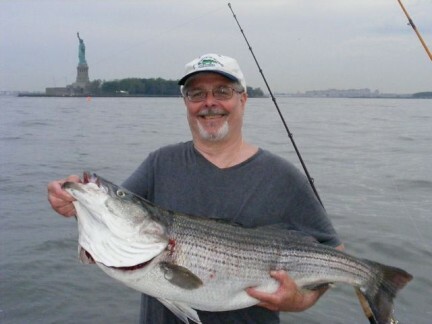 The New York Sportfishing Federation Forum & Auction at the Freeport Recreation Center has been tabbed the “can’t miss” sportfishing event of the year in New York, and kicks off this year on Saturday of President’s Day weekend with doors opening at 8a.m. with a good crowd expected early as anglers search out the best early deals to be found among the more than 50 exhibitor booths. FREE Fishing seminars have always been a spotlight of the Saturday and Sunday event, and our 2019 seminar line-up will feature topics like jigging for blackfish, tactics for catching trophy Stripers, surf tins, doormat fluke, offshore rigging and tactics for shark, surf and kayak fishing as well as many other seminars from top experts extending all the way through Sunday up until the big auction. Bid on auction prizes like this one won in 2014, a trip aboard Rocket Charters in Manhattan. Proceeds from the now two-day show and auction will benefit the New York Sportfishing Federation and its ongoing efforts to protect and serve New York’s sportfishing community. In recent years, New York Sportfishing Federation has used funds raised from the show to support their Teach a Kid To Fish Program, Casting For Recovery, and helping support important non-profit programs in the New York marine district like the Sweeney Sportfishing Center and Sportfishing Alliance, while also promoting sportfishing interests across both sides of the aisle in Albany. The New York Sportfishing Federation also helped sponsor production of Montauk Rocks, a film by Richard Siberry about America’s surfcasting Mecca which was released in 2013. And in addition to a kids fishing trips out of Captree and Freeport in 2016, New York Sportfishing Federation also sponsored a party boat trip for some of our New York service veterans in September of 2014! 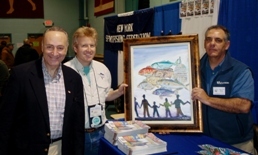 Sen. Charles Schumer with NYSF director Jim Hutchinson, Jr. and The Fisherman’s Fred Golofaro at the 2010 Freeport Show. Show times are Saturday, February 16th from 8am-6pm; Sunday, February 17th from 9am-2:30pm. A grand public auction takes place at 2:30 with various fishing items offered for sale including custom rods, reels, lures, books and videos, photos, apparel, charter and party boat trips. Admission is $12, $10 for kids and seniors, and children under 12 are free. The Freeport Recreation Center is located at 130 E. Merrick Road in Freeport, less than half mile west of Exit M9W off the Meadowbrook. There’s free parking at the event, but anglers are advised to arrive early on Saturday and Sunday as spots can fill up rather quickly! Check out the tentative 2019 line-up of seminars by the region’s top fishermen.